Founded in January 2007, we are a locally based real estate firm with offices in Beverly, Prides Crossing, Gloucester, Ipswich, Manchester-by-the-Sea, Marblehead and our newest office in Peabody. Our mission is to provide the highest level of real estate services to our clients whether owners of major estates or first-time home buyers. At J Barrett & Company our top priority is attention to detail and to our clients’ real estate needs. We provide an unprecedented level of service from the moment of first contact throughout the sales transaction. 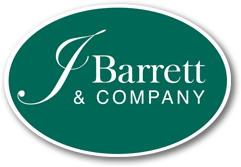 J Barrett & Company is uniquely positioned to provide excellence in every facet of its work. Our team includes over 150 highly respected and successful real estate professionals with extraordinary levels of expertise, as well as, marketing, financial, and legal professionals. We provide our agents with access to all the services necessary to address and to fulfill the needs of our clients, whether they are selling or purchasing property. The result is a win-win situation. We believe an individual customized marketing strategy is essential. Rather than offering a standard menu of services, J Barrett & Company draws from an extensive array of marketing resources and cutting-edge technology. Our marketing experts combine in-depth knowledge of real estate with innovative technology to produce original tools that will increase the appeal of a property. However, creating a customized strategy is only the first step. Because today’s evolving real estate market demands constant analysis, we continuously review marketing plans to ensure that we always use the most appropriate and effective resources available. The response to our vision has been overwhelming and we are grateful to our clients for their confidence and support. We welcome you and look forward to your continued patronage!